Jez Nelson had made his intentions clear for Jazz in the Round, the once a month evening at the Cockpit Theatre. He was going to mix it up a bit, to put on bands we might know alongside others we wouldn’t, and even present the audience with a bit of a challenge. This week's second show in the series achieved those intentions well, with an eclectic selection of three very different units. First up were guitarist Ryan Williams’ Flashmob, his quartet with Rory Simmons on trumpet, Will Collier on bass and Nick Smalley on drums. They created gentle, intimate music which was well suited to the venue. Williams’ guitar got a groove going. Simmons’ trumpet was at times soulful, or growling, at others high and plaintive. Flashmob were followed by Andrew McCormack in only his second solo outing. Or possibly his third, he couldn’t decide. He said he’d had to rethink his normal way of working. 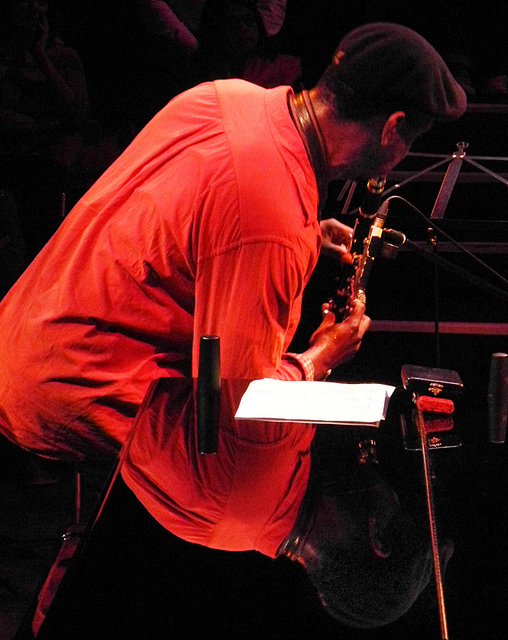 Jazz is a collaborative art, so to play solo, he had had to learn how to collaborate with himself. His set of four songs – two originals, two standards – consisted of lovely, thoughtful music. The tunes formed the basis for an exploration, setting off in different directions. McCormack’s music was captivating – on the strength of this performance, his solo playing deserves to be given more oportunities to become a habit! The first Jazz in the Round night in January had not presented a single drummer. This omission was duly compensated for by Shabaka Hutchings’ Sons of Kemet quartet – which features not just one, but two. Not often are fifty percent of the musicians in a band (and adding back in Nick Smalley from the first band, a third of the performers in an evening) drummers! Seb Rochford must be one of the in-demand musicians around – in the last year I have heard him in at least four different bands. Together with Tom Skinner as his partner in percussion, he laid down a variety of drum-heavy beats; Rochford had the lighter touch, Skinner an earthier rhythmic feel. The two drummers had a perfect balance, and clearly enjoyed the opportunity to play together – they were listening hard to each other. The drum beats might not have been swinging, but Oren Marshall’s tuba, providing the bass parts, certainly was. Dancing behind his tuba as he played, Marshall brought the feel of a New Orleans marching band – he produced some amazing sounds from his metres of brass tubing. On top of it all, Shabaka Hutchings played some gutsy sax and romantic, klezmer-like clarinet. At times his saxophone was all honking free-noise, at others lyrical song-lines. Despite the preponderance of percussion, this was clearly Hutchings’ band – as the only front-line instrument, it was his voice that dominated, however hard Marshall blew (and blow he did). This group draws on such a wide range of influences – Shabaka mentioned dubstep, Ethiopian music and New Orleans jazz - they could have met Jez Nelson’s stipulations of providing variety all on their own. An exuberant and playful band, they have rapidly developed a sound all of their own. What a lovely review. It's a terrific night to be involved in and we've got some exciting line ups booked. See you at Round 3!